A bench grinder is a power tool that facilitates grinding the surface of wood or metal as per the user’s specification. The machine can be fitted with various wheel attachments based on the work that needs to be done – polish, buff, clean, shape or sharpen the wood or metal object. This bench grinder is a versatile power tool that makes it easy to grind, smoothen, and sharpen wood and metal with effortless ease giving you a flawless and precise result. JET 577102 JBG-8A bench grinder is very powerful machine. It can shape, smoothen and sharpen wood and metal quickly. It can also clean, polish, buff, deburr and remove rust from metal. The powerful motor is designed to endure high volume requirements of busy shops. The unit includes dual ports for collection of dust generated during grinding. Spark guards and eye shields can be easily adjusted as per the user’s convenience. Ball bearings are well lubricated and totally enclosed. 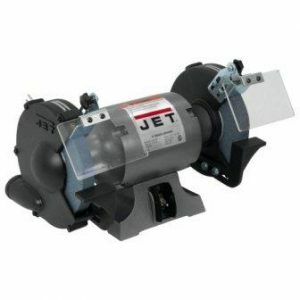 JET 577102 JBG-8A bench grinder is compact in size making it the ideal power tool for smaller work spaces. This bench grinder features two grinding wheels. Wheels are 1 inch thick and 8 inches in diameter. One wheel is for coarse grinding with 36 grit. The other wheel is for fine grinding with 60 grit. Wheel flanges made with cast metal, are sturdy and long lasting. 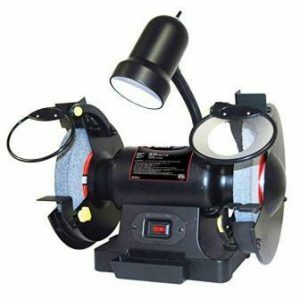 JET 577102 JBG-8A bench grinder comes with rubberized feet. This helps prevent movement and absorbs shock when the motor is running. The rubberized feet can also be fastened on the work surface with the help of bolts to ensure better stability. The unit has a heavy duty toggle switch. Some users have complained of the cast iron wheel flanges developing fine cracks after prolonged use of the bench grinder. 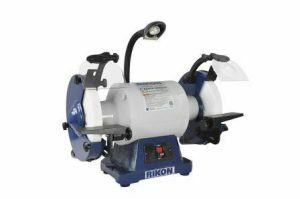 RIKON 80-808 is a low speed bench grinder that can complete the task it is put to with flawless results. Compared with high speed bench grinders, the ones with lower speed perform better when it comes to sharpening tools. Besides delivering a flawless result, low speed bench grinders are less likely to over-heat the edge of the tool (especially metallic ones) and also gives the user, good control. Low speed bench grinders have lesser noise output and also generate comparatively less grinding dust. RIKON 80-808 bench grinder is a low speed, yet powerful machine. It effortlessly cleans, buffs, polishes and deburrs as well as removes rust off the surface of metal. It also smoothens, sharpens and shapes wood and metal with absolute ease. The robust motor is engineered to withstand high volume requirements of busy production shops. The unit includes two sets of spark guard / eye shields. One set is plain, while the other set offers 2.5x magnifying. Rubberized feet on RIKON 80-808 bench grinder help absorb excess vibration while the motor runs. This prevents movement of the unit and offers greater stability. RIKON 80-808 has sturdy wheel guards made cast iron. Tool rests made with cast iron are adjustable, flat and extra-large. Two cast iron ports on back of the wheel flanges, facilitate easy dust collection. RIKON 80-808 comes with two grinding wheels that can handle the toughest of grinding work with ease. The unit is compact and produces less noise. This makes it ideal not just for industrial use but also for use at home for DIY projects. The unit features an LED light. ATD 10558 is yet another high quality product from ATD Tools. This bench grinder delivers flawless results time after time. Users have said they have been using this bench grinder since many years and have no complaints with the performance even after such extensive use. The unit features two grinding wheels. One coarse grinding and one for fine grinding. Eye shields are adjustable and shatter resistant, despite being frequently exposed to heat. The unit comes with one set of plain eye shields and a set of magnifying eye shields. ATD 10558 features a large work light for better visibility and increased accuracy. Reviewers have said that the unit vibrates quite a bit when it is running up. However, running the machine gets smoother once it comes up to speed. Just like other tools and machinery, bench grinders also require a certain amount of maintenance to ensure it works efficiently. It is imperative to regularly check the wheels if their sharpness is dulled and replace if necessary to ensure smooth functioning. It would be advisable to invest in an additional wheel so you always have a back-up. Bench grinders are heavy and have some small parts that are detachable. Make sure it is stowed away safely so it is out of reach for children, to prevent any injury or choking hazard.